A new county flag has been flown in Nottinghamshire for the first time. 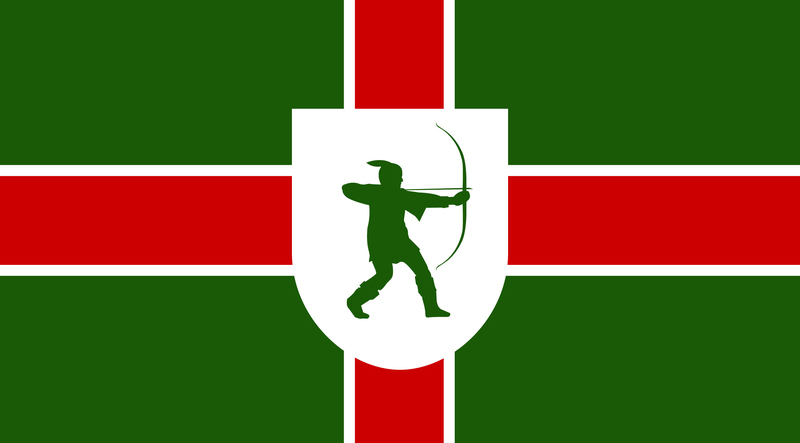 During an official launch, the green, red and white flag was raised at Nottingham Castle, Newark Castle and in Mansfield Market Place. The design, which has been registered by the Flag Institute, was chosen by thousands of people who took part in an online vote on the BBC website. The idea to create a new flag came from two BBC Radio Nottingham listeners, Jane Bealby and Mike Gaunt. They both separately contacted Andy Whittaker's breakfast show , saying the county needed a flag for the Nottinghamshire public to fly. The presenter mentioned the idea on air and said he was overwhelmed with the level of positive response, with people ringing in to his show and sending in their designs. A panel of judges came up with the final design by combining elements from various ideas submitted to the radio station. The flag incorporates St George's cross on a green background, and a shield with the Robin Hood emblem in its centre. "It's a simple but striking design and I'm really pleased with it. There is no copyright, so it can be used by everyone", said radio presenter Andy Whittaker. There is no official flag for the county but this is the only flag for Nottinghamshire registered with the Flag Institute. The Flag Institute maintains and manages the national registry of United Kingdom flags and this flag complies with its strict UK Flag Registry criteria . Andy said he saw the new design as "the people's flag". "The idea came from the people, the designs came from the people and it's now a fantastic flag for the people of Nottinghamshire to fly with pride." A number of flag makers have decided to sell the new flag, while car stickers featuring the design are available free at certain supermarkets in the county. 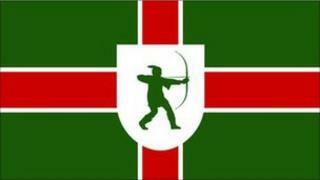 Download an image of the Nottinghamshire flag [132 KB].